Celebrating the life of William "Bill" A. Bock Jr.
Obituary for William "Bill" A. Bock Jr.
William “Bill” A. Bock Jr., 70, of Iowa City, died unexpectedly at his home in Iowa City on Monday, March 18. A memorial service will be held at 11:00 a.m. Sunday, March 24, 2019 at Lensing Funeral & Cremation Service, Iowa City. Family will greet guests from 10:00 a.m. until the time of service at the funeral home. Burial with Military Honors will follow at Memory Gardens Cemetery, Iowa City. In lieu of flowers, memorial donations may be directed toward the Fraternal Order of Eagles #695, 225 Highway 1 West, Iowa City. William A. Bock Jr. was born on, June 11, 1948 in Iowa City, Iowa, son of William Sr. and Phyllis Ina (Mathes) Bock. Growing up in Iowa City, Bill attended Longfellow Elementary, Southeast Junior High School and graduated from Iowa City High School in 1966 and later continued his education at Kirkwood Community College. In 1966, Bill enlisted in the US Navy and went to Vietnam and was discharged from active duty in 1968. Bill opened Studio 114 in 1981, where many lifelong friendships were discovered including several marriages of Studio 114’s regular patrons. Bill later went to work at the Sports Column until 2005. 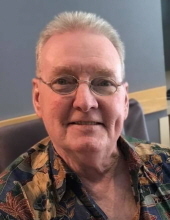 Throughout Bill’s life he enjoyed golf, softball, bowling, gardening, weightlifting, country music, watching the Hawkeyes, the Chicago Bears & the Cubs; as well as socializing and having a few cold ones with his buddies at the Eagles. Bill is survived by his children, Matt Bock of Des Moines and Maggie (Michael) Martin of Urbandale; his grandchildren, Presley, Violet and Maverick Martin; his siblings, Gary (Jacki) Bock, Tim Bock, and Stephanie (Craig) Newlun; his former spouse, Stephanae Bock and numerous extended family and friends. To send flowers or a remembrance gift to the family of William "Bill" A. Bock Jr., please visit our Tribute Store. "Email Address" would like to share the life celebration of William "Bill" A. Bock Jr.. Click on the "link" to go to share a favorite memory or leave a condolence message for the family.